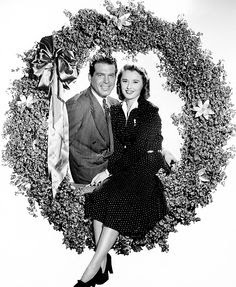 Remember the Night (1940) is a rarely seen holiday classic features the first screen pairing of Barbara Stanwyck and Fred MacMurray. Stanwyck is Lee Leander, a shoplifter on trial for stealing an expensive bracelet from a jewelry store during the Christmas holidays. The judge decides to postpone her trial till after the New Year, which means Stanwyck would be spending Christmas in jail. Lawyer, John Sargent (MacMurray) takes pity on Lee and pays her bail so she doesn’t have to spend the holidays locked up. John invites Lee to his mother’s home, where he grew up, which makes a big impression on her. The warmth of Sargent’s family and the magic of the Christmas holiday make Lee take stock of her life. Directed by the too-often-neglected Mitchell Leisen, with a script by Preston Sturges, Remember the Night features a dream of a supporting cast that includes Beulah Bondi, Elizabeth Patterson, and Sterling Holloway.